I was at the mall this evening waiting for my car to be repaired. I strolled over to Border’s Book Store and found the Crochet books, grabbed a bundle of them, found a chair, and began to browse through them. I was completely enthralled by this wonderfully clever little book. 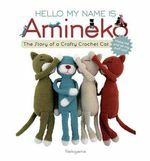 I didn’t have any money with me and couldn’t really review the book for you, but I can tell you that if you know a crocheter who is cat-crazy (not me), this book would be a great gift! The book is one part crochet, two parts comic book, and three parts charming! The title above is the book’s official title, so you should be able to track it down. Hope you enjoy it as much as I did! Agree! What a great gift for a crocheter who loves cats or knows someone who does. Sounds like a really fun find! I just picked up this book, too! Couldn’t leave it on the shelf. Hope to start crocheting a neko soon. I have crochet this cats and there are sooo cute!!!! The book look so great!